Good morning class. Welcome to round three of Alphabe-Thursday! Gosh, D was a tough week with the blogger problems. I'm sorry everyone lost their comments. I did get around to visit you all, so I hope my comments showed up! I haven't figured out my E post yet. I need to get a move on! I am late but faithful this week! Hee Hee! Love those elephants! E was hard. I ran through so many E words and got nothing. then just decided on something easy. Hope you enjoy it. 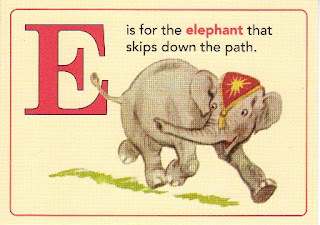 Love your elephant card and I'm keeping you in my good thoughts and prayers. Happy to be back for another alpha day!